Early in life, Kim Haas enjoyed reading about entrepreneurs - not your usual subject choice for an adolescent. She also loved traveling with her grandmother. She lived in Spain during her junior year in college and resided in Sicily where she studied Italian. Kim is fluent in Spanish, Italian, and Portuguese. After earning both undergraduate and graduate degrees in Spanish, Kim worked for Philadelphia’s affiliate of Telemundo, the Spanish language television network as Director of Marketing. After Telemundo, she took a key position in the Communications Department of Philadelphia’s Mayor’s Office of Community Services, providing a range of outreach services for diverse populations. She moved to Milwaukee in 2003, with her husband Ed who was offered his medical residency. Kim had a good job offer as well, but turned it down to “reinvent” herself as an entrepreneur. Because of her love of languages, a great appreciation of different cultures, and interest in the communications field, she started Haas Media LLC. In 2005, after being in business for a year, the firm partnered with engineering firms to work on Wisconsin Department of Transportation’s largest highway reconstruction project: The Marquette Interchange. Since then, Haas Media LLC has been providing a range of public relations, community outreach and translation services for WisDOT’s billion dollar projects including: I-94 North South Corridor and The Zoo Interchange Projects. As part of the services offered to WisDOT, Haas Media LLC designs and facilitates “Careers in Motion: Science, Engineering and Transportation.” This award winning program introduces “One of the most important things you can do if you are considering starting a business is make an appointment to meet with a SCORE Counselor. 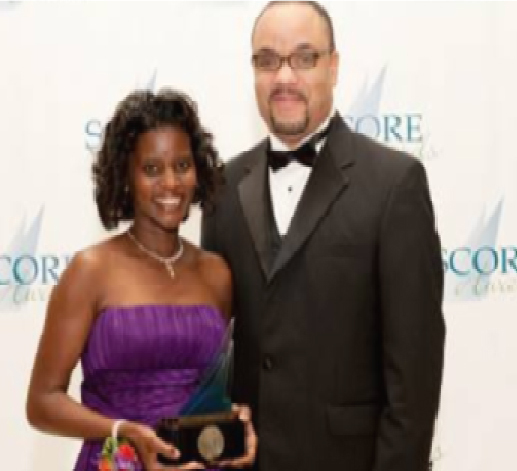 The service is invaluable.” “SCORE counselors helped me define goals, provide a sounding board for long term plans, and serve as mentors on day to day issues.” -Kim Haas, Founder and President, Haas Media LLC Kim Haas accepting the SCORE award for Outstanding Minority Owned Business from Brian Tippens of Hewlett Packard. elementary and middle school students to the wonders of science, engineering and transportation. In 2005, Haas Media LLC was awarded another contract working for a state agency – The Wisconsin Department of Tourism. The firm launched the state’s first Hispanic Marketing Campaign promoting Wisconsin tourism to Spanish speaking tourists. A year later, she returned to the east coast opening a second office of the firm serving the New York Metropolitan Area. One of the first things she did was contact SCORE’s Manhattan office. There she met SCORE Counselor Howard Geltzer. Kim handled the financial crisis that severely affected both the Milwaukee and New York markets. “It was challenging, but the strong relationships that Haas Media LLC developed pulled us through. 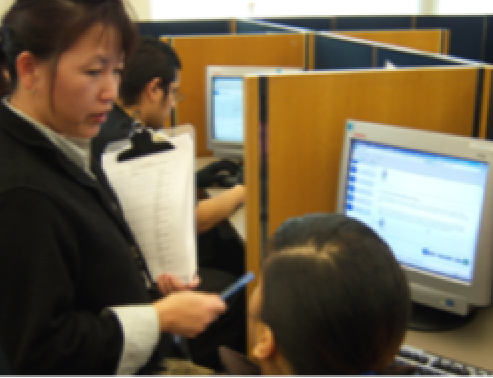 It forced us to look for new customers and markets.” As a result, Haas Media LLC was awarded a contract to provide Hmong/English interpreting and translating services for the Milwaukee County Health and Human Services Department. She sees a bright future for Haas Media LLC in the US, as well as abroad. Kim is positioning the firm for substantial growth in the global market, helping both US and foreign companies solve communications issues through cultural training and other communications needs. Today, Haas Media LLC has associates working in Milwaukee and in the New York Metropolitan Area. Haas Media LLC provides public relations, community outreach, translation/editing services and educational initiatives. The services are provided in English, Spanish, Portuguese, and Italian for corporations, government agencies, small business, non-profit and community organizations.